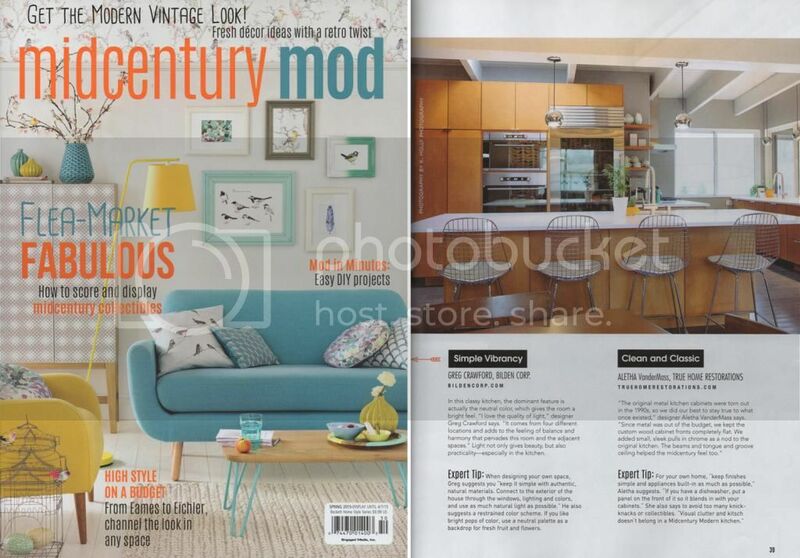 A few months ago, Victoria at Engaged Enthusiast Media contacted me about our kitchen design for a one-time issue magazine, midcentury mod. I happily answered a couple of questions about the design of our kitchen, and just last night grabbed a copy at my local Meijer store to see it in person. Besides spelling my last named incorrectly (they spelled it VanderMass; it's actually VanderMaas - easy to confuse! ), it looks absolutely fabulous. It is SO fun to see True Home Restorations in print - a HUGE THANK YOU goes to Kristen at K. Holly Studios for capturing our kitchen for this! Go out a grab a copy today - not a single advertisement means there are 130 full pages of midcentury modern goodness to enjoy! I bought this magazine, and I am so enjoying slowly going through it and reading every word. I love your kitchen remodel. I recently bought a home and will be doing a kitchen remodel myself. Lots of great ideas here. Thank you for sharing your home.